in-person appearances – live performance – masterclass – workshop – orchestral/concerto solo – chamber music – recital – keynote address – lecture-demonstration – recording – seminar – retreat – conference – consultation – coaching – presentation – multimedia concert – and more! "For all of Chang's extroverted, deadly accurate virtuosity, she plays this work as music first, showpiece second." "She phrases with natural urgency and tames every pianistic beast before her. " "The challenge for the performer is to make these subtle mood shifts and color changes seem natural as well as make the technical passages sound seamless. And pianist Angelin Chang did all of this with style and grace....mesmerizing....magical." 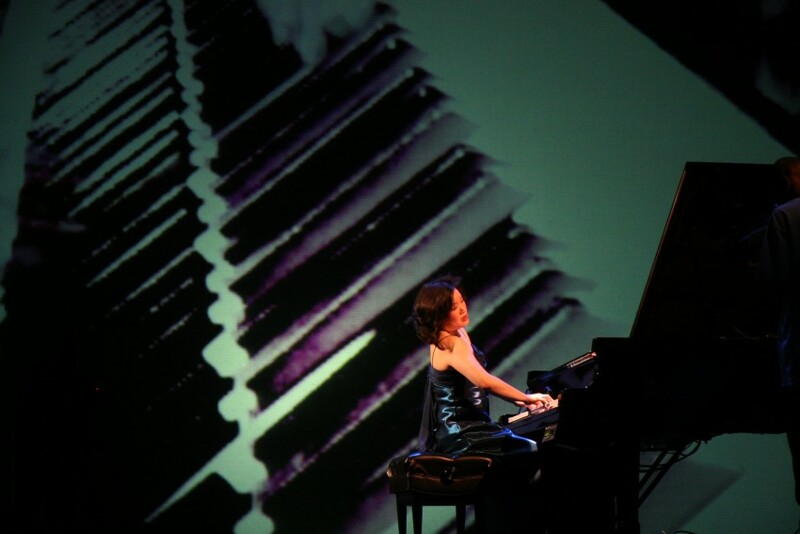 "Invariably excellent...pianist Angelin Chang's alternately prismatic and pointed artistry." Internationally acclaimed pianist Angelin Chang is the first American female and the first pianist of Asian heritage to be awarded the GRAMMY for Best Instrumental Soloist with orchestra. She is recognized for her sense of poetry and technical brilliance. Concertizing in Europe, Asia, Africa, North and South America, Miss Chang’s concert tours have led her to such venues as the Kennedy Center (Washington, D.C.), Kimmel Center (Philadelphia), Lincoln Center (New York), Severance Hall (Cleveland), St. Martin-in-the-Fields (London), Zelazowa Wola (Warsaw), Shanghai Grand Theatre (China), Sala Luis ngel Arango (Bogot), Schnittke Philharmonic Hall (Russia) and the South African Broadcasting Corporation. She is the first American awarded First Prizes in both piano and chamber music during the same year from the Conservatoire National Suprieur de Musique de Paris, France. As the first Artist-in-Residence at the Kennedy Center in Washington, D.C., Angelin Chang participated in the development and launching of the Arts for Everyone initiative. She has performed at the U.S. Department of State, for the United Nations Women's Organization in Nepal and for World AIDS Day in New York for the United Nations before the Secretary-General. An active chamber musician, she performs regularly with the legendary violist Joseph de Pasquale, The de Pasquale String Quartet, and with members of the Philadelphia Orchestra and Cleveland Orchestra. Angelin Chang earned the Doctor of Musical Arts from Peabody Institute – Johns Hopkins University, Premier Prix - Piano and Premier Prix - Musique de Chambre from the Paris Conservatoire, Master of Music and Distinguished Performer Certificate from Indiana University, Bachelor of Arts (French) and Bachelor of Music from Ball State University, and highest honors upon graduation from the Interlochen Arts Academy. Her piano teachers have included Michel Broff, Marie-Franoise Bucquet, Yoheved Kaplinsky, Yvonne Loriod-Messiaen, Robert McDonald, Menahem Pressler, Pierre Rach, Pia Sebastiani, Gyrgy Sebk, Louis-Claude Thirion and Dorothy Taubman. She also holds a Juris Doctor from the Cleveland-Marshall College of Law. Dr. Angelin Chang is Professor of Piano and Coordinator of Keyboard Studies at Cleveland State University, where she is also Professor of Law at the Cleveland-Marshall College of Law. She serves on the faculty of the Great Lakes Sports and Entertainment Law Academy, a joint program of Case Western University School of Law and Cleveland-Marshall College of Law at Cleveland State University. Previously, Dr. Chang taught on the piano faculty at Rutgers - The State University of New Jersey. Through her work with the Taubman Approach and Keyboard Wellness Seminars at the University of North Texas and Temple University in Philadelphia, Dr. Chang helps pianists develop virtuosity while liberating them from fatigue, pain and injury. Angelin Chang is Vice President, Board of Governors of The Recording Academy Chicago Chapter (National Academy of Recording Arts and Sciences) and serves as Chair of the Education Committee and the Classical Task Force. She is Past President of the Ohio Music Teachers Association Northeast District and has served on the Board of Trustees for the Great Lakes Theater. Dr. Chang is the Co-Chair of the Research Committee on Asian and Pacific Studies of the International Political Science Association (IPSA/RC18). Recordings include solo piano album, Angelin (Sabintu Records), Soaring Spirit (Albany Records) with Angelin Chang on piano and Joseph de Pasquale on viola, and Cleveland Chamber Symphony (TNC) with Angelin Chang as piano soloist and John McLaughlin Williams as conductor in Olivier Messiaen’s Oiseaux Exotiques and Dmitri Shostakovich’s Piano Concerto No. 1. Angelin Chang is Yamaha Corporation of America's first Academic-Performing Artist. Her use of the Disklavier hybrid piano in presentation and performance is available upon request. A tuned concert grand piano is typically provided by the presenter/venue. Use of the Disklavier hybrid piano in presentation and performance is available upon request. Special arrangements for other equipment or instruments may be negotiated. Stage setup: keyboard is on audience left and tail of piano audience right. Full stick of lid opened for performance.